There is a crochet project I’ve had my eye on for awhile and thought I could figure out how to do it as a knit, but have finally decided it would be easier to learn how to crochet! and nothing wrong with learning something new! 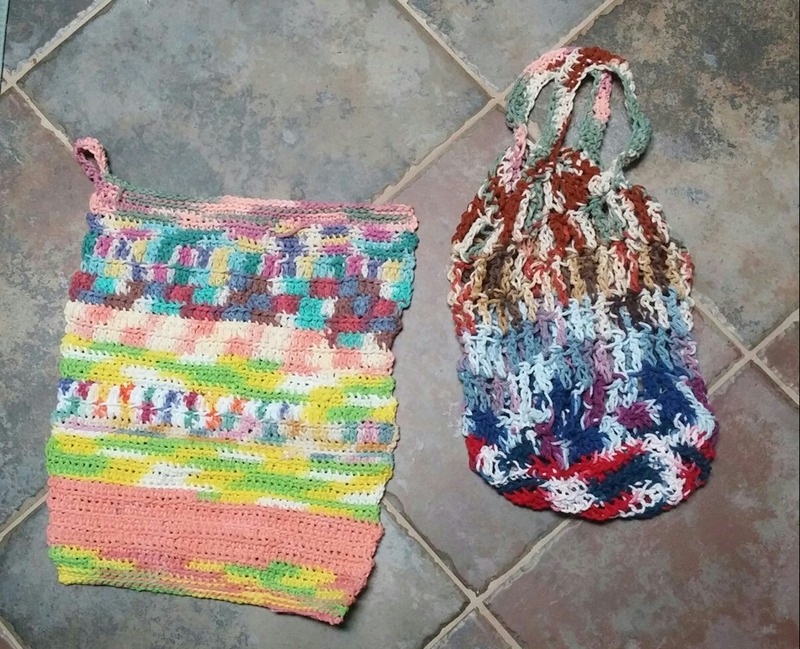 Had a whole bunch of bits of Peaches n cream cotton left over from little projects I did when learning how to knit (washclothes, string bags, pot holders, etc) and for what ever reason had put all those little bits together, which yielded the yarn for these two crochet projects. The string bag was a total free hand experiment in knitting in the round, decreasing and increasing, gauge, etc. Crochet uses a lot more yarn per square inch than knitting as it is a tighter and denser stitch. It also doesn’t stretch like knitting does, at least not in the cotton. Will do some more experiments; the string bag gave me some ideas for doing a slouch hat and will use acrylic for that which will give me more of an idea of stretchiness. This entry was posted in crochet, homesteading, knitting, patterns, prepping, self-reliance, Uncategorized. Bookmark the permalink.